Her Majesty’s Customs And Excise Department Celebrates International Customs Day 2017 With A Week Of Activities. 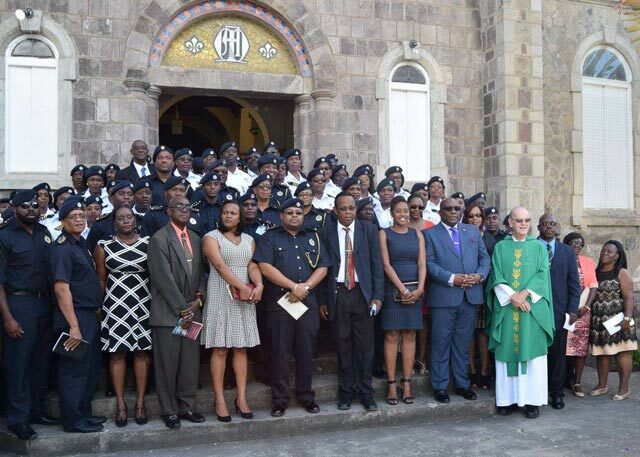 Basseterre, St. Kitts, January 23, 2017 (SKNIS): Her Majesty’s Customs and Excise Department in celebration of International Customs Day (ICD) 2017, slated for Thursday, January 26, launched a week of activities, which commenced with a church service on Sunday, January 22. Prime Minister and Minister of Finance, Dr. the Honourable Timothy Harris, said that recognition is often given to the Customs and Excise Department for the work they do. “Each year, our Nation pauses at special moments to remember and to celebrate the significant contributions made by the many groups and organizations whose daily work positively impacts the growth and development of our Country,” he said. The week of activities continues today, Monday, January 23, with visits to selected schools on both islands. Dr. Harris noted that the visit is aimed at exposing “young people to the wonderful opportunities and sound responsibilities” available at Customs. The management team is expected to meet with farmers, fishermen, agro-processors and other stakeholders on Tuesday, January 24. According to Prime Minister Harris, this meeting will be geared towards discussing “the readiness of the Customs Department to meet stakeholder expectations and to facilitate their imports and exports in accordance with the soon to implemented Trade Facilitation Agreement of the World Trade Organisation”. The Customs and Excise Department on both islands will host an Open Day on Friday, January 27, where all are invited to witness and learn more about the operations of Customs. The week culminates on Saturday, January 28 with a family fun day. Prime Minister Harris used the occasion to commend the hard working men and women of the St. Kitts and Nevis Customs and Excise Departments and said that the week will be impactful as it commemorates the significant role of the officers to the continued progress of the Nation. “I am confident that this will be a week in the records of the Customs and Excise Department and for our Country. It will set the right tone for a successful year for us all. That is why it gives me great pleasure, as the Prime Minister of the Federation and Minister of Finance, to declare open Customs Week 2017 and beseech God’s blessing on every planned event in the calendar of activities,” he said. ICD 2017 will be celebrated under the global theme “Data Analysis for Effective Border Management”. The day is observed by custom organizations every year on January 26 and is celebrated to commemorate the very first official conference of the Customs Co-operation Council – the World Customs Organization (WCO). WCO was established in 1952 as an autonomous body to enhance the effectiveness of the customs administrations worldwide. According to data fromhttp://www.wcoomd.org/ WCO has 180 members, three-quarters of which are developing countries, responsible for managing more than 98 percent of world trade.